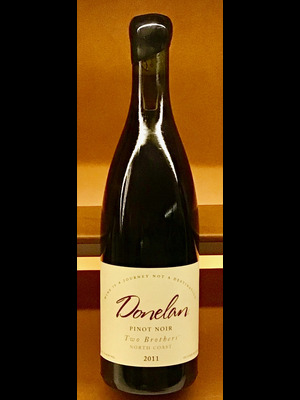 92 Points - Robert Parker - The Wine Advocate: "The red wines include the 2011 Pinot Noir Two Brothers which comes from four relatively high elevation sources, three in Sonoma and one in Mendocino. It was aged 18 months in 20% new French oak and finished with 14.4% alcohol. Its medium ruby color is followed by seductive aromas of kirsch, strawberries, loamy soil and a hint of oak in the background. A remarkably successful 2011, it is a medium-bodied, velvety, long Pinot Noir to consume over the next 5-7 years."